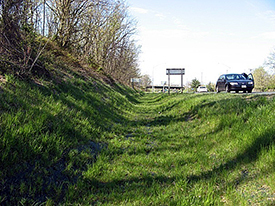 Land Use Change BMPs improve water quality by converting land into a more natural environment. Impervious area removal identifies existing impervious surfaces that can be removed and replaced with vegetative cover such as grass and trees. Existing impervious areas that could potentially be removed include abandoned roadways, concrete ditches and raised concrete medians. 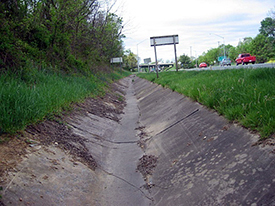 Removing impervious surfaces decreases stormwater runoff by allowing rainwater to infiltrate into the ground that removes pollutants, recharges groundwater and reduces the pollution entering local streams. 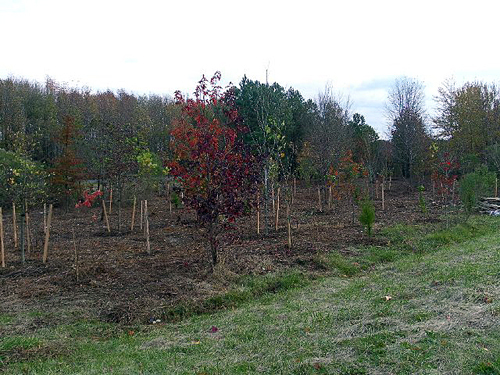 Plantings Trees converts pervious grassy vegetated areas into forested areas. Reforestation is an economical and sustainable way to increase the uptake of pollutants (nitrogen and phosphorous) and reduce the flow of sediment from stormwater runoff. Types of species planted include a mix of deciduous and evergreen trees native to the Chesapeake Bay region. Trees can reduce the intensity of stormwater runoff by intercepting rainfall in their canopy and bark, as well as directly absorbing water through their roots. Tree roots and leaf litter can also improve soil conditions for infiltration and convert pollutants into less harmful substances. Planting trees along rivers and streams has added water quality benefits. Creating or expanding forested stream buffers is an effective strategy because trees decrease the concentration of nutrients that flow directly into a stream from the land through absorption, and they slow soil erosion and sediment runoff by stabilizing the stream bank by the tree roots.